I grew up in the Midwest, and both my parents were in education. My mom was an elementary school teacher and my dad was a college professor at UW Madison, Wisconsin. I rebelled at the thought of ever being a teacher. I just did not understand why both my parents were so passionate about learning, education, and the bonds they created with their students. 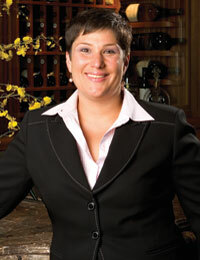 My goal was to work in the restaurant business and my career aspirations were to become a chef and later a sommelier. In my eyes, this had nothing to do with being an educator. As my career progressed, I began tackling certifications and accreditations. I quickly learned that a college degree and hands-on experience were only a small part of becoming a better hospitality professional. I was taking classes at the Culinary Institute of America, attending any and all lectures about wine, and working with amazing professionals that I wanted to emulate. I was a student and never thought about what it would be like to teach. Then an opportunity came my way that forever made me a passionate teacher. At an AIWF event, I met an amazing woman who had created a wine appreciation course at San Diego State University and needed assistance teaching. Her name is Deborah Lazear, and she had me substitute teach the foundational wine course, Exploring Wine, in approximately 2006. When the opportunity to permanently teach the course became available, I jumped at the chance. Over the last 10 years, it’s gone from a four-week class to an eight-week class. This led me to develop two Intensive courses, Italian Wines (on terroir) and my favorite, Dessert Wines. The wine program at SDSU is always evolving, and I serve on the board of advisors to assist in the development of new classes to meet the needs of students. I never imagined relishing teaching as much as I do, but Deborah not only taught me how to convey the passion I feel for wine to students, she opened my eyes to the magic of teaching. I love the “ah ha” moment of seeing light bulbs go off in students’ eyes when explaining that Chablis is a place, not a grape, or the effects of soil on a wine. Many of my former students have gone on to start their own wine business, make their own wine, open a wine bar, sell wine, or advance in accreditations and pursue their love of wine. It’s inspiring to see students flourish and challenge themselves to try obscure wines, discover new destinations, or fall in love with a style of wine they previously didn’t enjoy because they didn’t understand it. One of the biggest things I’ve learned is that education is not a one-way street. There are many benefits to becoming a teacher in a university setting. One of the greatest reasons is that students truly want to be there. In SDSU’s Business of Wine program, every class is made up of wine professionals seeking more education, and wine consumers pursuing their passion or second career opportunities. The common thread to these diverse student profiles is their desire to learn. The questions that students ask me inspire me to keep my knowledge sharp, and the different mix of backgrounds affords me an opportunity to be a better wine professional and learn from them as they learn from me. I have also discovered that even though you know much about wine, articulating that knowledge can be challenging. Most importantly, I have forged great relationships with former students, many of whom are now mentors, friends, and colleagues — which all began in a foundation-level wine course! As an adult, I now clearly see why my parents made their home and careers in education. The reward of seeing others grow and to give back to an ever-changing industry extends beyond a paycheck. I feel such pride and jubilation when a student of mine accomplishes a goal they set in the wine industry. It could be opening a business, passing a certification, taking on new challenges as a second career, or leaping into the hospitality industry. If you have the opportunity to teach, it is an adventure not to be missed!